I live in a medium-size city in Saitama Prefecture and am puzzled by a speaker system mounted on a huge pole right outside my apartment. Every evening at 5 p.m., music plays from the speakers for 20 or 30 seconds and then stops. It’s the same song every day, which I don’t recognize, and it’s really, really loud. Occasionally, there is also a public announcement from the speakers. Even if my Japanese was up to the challenge, which it’s not, I doubt I’d understand what they are saying because the sound quality is pretty bad. But it’s the music that’s really got me wondering because it comes at the same time every day, like clockwork. My Japanese coworker told me it’s so children know it’s time to stop playing and go home, but all the kids I know go to cram school and don’t head home until well after dark. So, what the heck is that music? What you’re hearing is colloquially referred to as the goji no chaimu (the 5 p.m. bell) but the proper term is more of a mouthful: shichōson bōsai gyōsei musen hōsō (local government disaster administration wireless broadcast), or bōsai musen (disaster wireless) for short. That naming alone should tip you off that there’s more to the music than your coworker seemed to realize. Your little evening concert is actually a daily test of an emergency broadcast system to alert citizens of dangers such as tsunamis and industrial accidents. More than 90 percent of cities, towns and villages in Japan have similar systems, but the timing of the daily test varies as does the music played. Many jurisdictions have one daily test at noon, for example, or run test broadcasts twice a day, at, say, noon and 6 p.m. in the evening. The thinking is that as long as there’s going to be a daily test, it may as well be timed so it serves some other purpose, and reminding kids to head home before dark is a popular one. In many localities the evening broadcast is timed to 5 p.m. in the winter months and 5:30 p.m. or 6 p.m. as the days get longer. The horn-shaped speakers may look low-tech, but in fact they are linked to a national system that can transmit warnings to local governments throughout the country in as little as seven seconds. 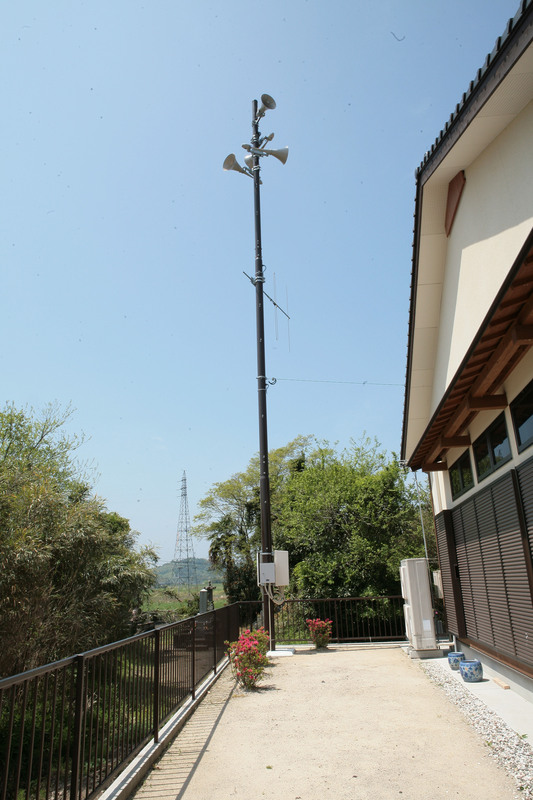 The nationwide disaster-warning network was launched about 50 years ago, following a major earthquake in Niigata Prefecture in 1964, and has received changes and improvements over the years. The current focus is on upgrading equipment to newer digital systems. To find out more, I paid a visit to the headquarters of Fujitsu General, one of the largest manufacturers of bōsai musen systems. Sales director Tadashi Maekawa explained that the latest digital systems can do a great deal more than simply send broadcasts to speakers like the ones outside your apartment. They can also transmit simultaneous alerts to mobile phones, fax machines and devices for the hearing-impaired; insert messages into radio and television broadcasts, and even automatically post information on the local government’s Web page. Local systems can also be linked to the central government’s satellite-based J-Alert system, which was launched in 2007 to directly inform the public of various threats, including the launch of missiles by North Korea. “With the older analog systems, local governments can transmit but they can’t receive,” Maekawa explained. 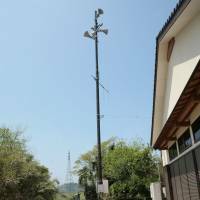 “But digital systems make it possible for citizens to report in via wireless telephones that are mounted on the speaker poles, for example. This can be a big help in accounting for people’s safety and directing emergency responses.” Yet only 30 percent of existing systems have been upgraded to digital, according to statistics from the Ministry of Internal Affairs and Communications. While emergency broadcasting is the raison d’être for bōsai musen, most local governments also use them for public announcements. Where I live we get occasional announcements such as reminders to vote on election days. But apparently some local governments overuse the systems, bombarding citizens with information they’d rather receive via quieter means. “The noise of the outdoor broadcasts is definitely an issue,” Maekawa told me. Complaints dropped off after the Great East Japan Earthquake in March 2011, when people were feeling the importance of emergency broadcasts, but the noise can be bothersome, particularly for people who work at night and sleep during the day. Someday, the sounds of bōsai musen may be heard outside of Japan, as manufacturers and disaster-management experts are looking at its export potential. As we unfortunately learned in the 2004 Indian Ocean tsunami, not all governments have the means to warn their citizens quickly,. Emergency broadcasting is one area in which Japan has special expertise. I think it would be nice if that could be made available to the world. For more on this topic, including links so you can hear bōsai musen for yourself, please visit my blog at www.alicegordenker.wordpress.com. Puzzled by something you’ve seen? Tell me about it: whattheheckjt@yahoo.co.jp or Alice Gordenker, A&E Dept., The Japan Times, 4-5-4, Shibaura 4-chome, Minato-ku, Tokyo 108-8071.